By now, we’ve all been shown Roger Stone‘s back, with Nixon‘s portrait tattooed on it, and know that Nixon was Stone’s hero, and that Stone played what Snopes calls a “consequential role” — though not enough to qualify him as an “advisor” — in Nixon’s re-election campaign, 1972. 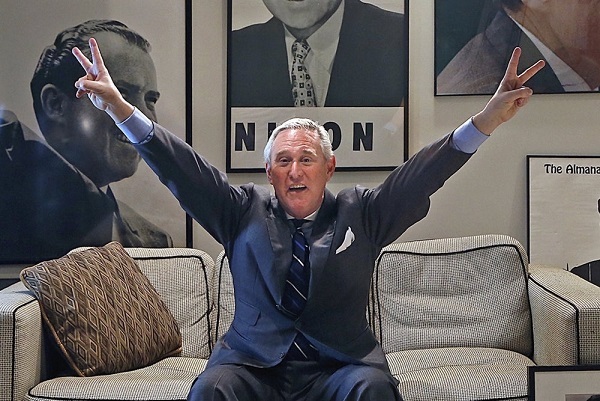 And we’ve seen Roger Stone, just the other day, emerging from court and giving an exultant copy of that Nixon victory sign. 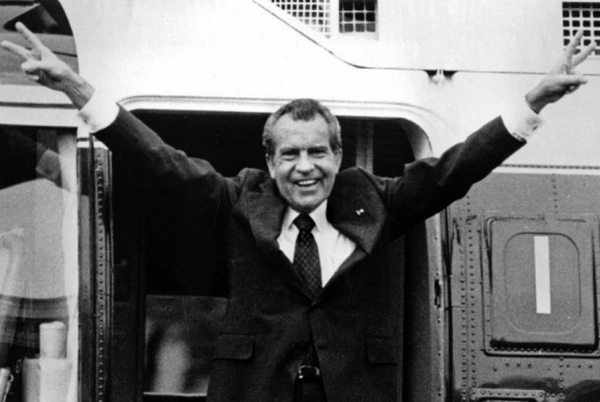 It would be all too easy to juxtapose the two, and claim a DoubleQuote — while it also seems just a little strange not to note it..
Maybe this version of Stone‘s salute — surrounded and indeed haloed by Nixon memorabilia — is sufficiently different to cause some measure of surprise or delight. I can’t hope for an in-drawn breath on this one — but a quiet chuckle from some of you, perhaps? Or how about the great original, Winston Churchill? Howzzat for a DoubleQuote with Richard Nixon. 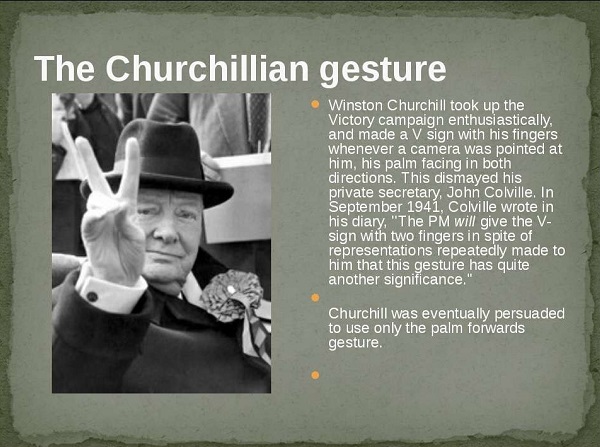 Nixon’s sign is victory in defeat — Churchill’s is victory en route to Victory! As regular readers here will know, the disjunction and conjunction of the spiritual and military is a central focus of my thoughts and posts here on Zenpundit. “The situation is interesting in spiritual sense, it reminds of a big convent without Internet, television and almost without a telephone. All servicemen are involved in sport activities, they have a great demand in reading,” the hierarch said in his interview with the Pobeda radio. The bishop noted that the servicemen participated in pastoral conversations with great interest. “This informational blockade helps them refresh their conscience, in result they have a demand to talk about important spiritual moments. It impressed me much,” he confessed. “Not only weapons and outfit, but their new way of thinking impressed me. It was seen in their discipline, in organization of service, which we witnessed during the week. It differed so much from all the things I saw before that I sincerely rejoiced,” the bishop said. That’s worth pondering, you know, as we think about Putin‘s Russia and current events in Syria.. The near-pacifist son of a World War II naval war hero in me was intrigued enough to go searching for Onward Christian Soldiers as a musical match for this article, and it was in search of an appropriate rendering of the hymn that I ran across the FDR / Churchill footage. I am profoundly glad it did. The other hymn sung in that clip is the quintessential naval hymn, Eternal Father, Strong to Save with its refrain, O hear us when we call to Thee / For those in peril on the sea..
Let’s pre-amble around a bit, before we get to Cole Bunzel‘s important new paper, The Kingdom and the Caliphate: Duel of the Islamic States in my next post: the issue of oratory vs force is significant in its own right. Essentially, war is fghtiing, for fighting is the only effective principle in the manifold activities designated as war. 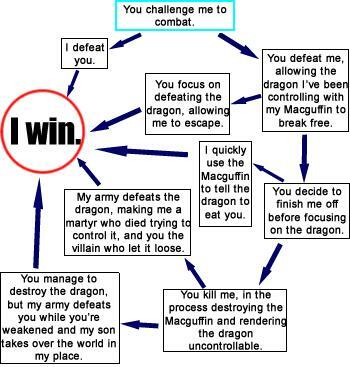 Fighting, in turn, is a trial of moral and physical forces through the medium of the latter. Naturally moral strength must not be excluded, for psychological forces exert a decisive in?uence on the elements involved in war. As between the material and the immaterial, then — and notice how the word immaterial has come to have the pejorative meaning, irrelevant — Clausewitz gives greater importance to the immaterial, the psychological. So — how do we measure the impact of Winston Churchill’s oratory, as a morale-multiplier, to compare it with that of the output of US aircraft factories just prior to and during the war — 100,000 aircraft, I am told, to include “the Army Lockheed P-38 Lightning, P-39 Airacobra, Curtiss P-40 Warhawk, P-47 Thunderbolt, North American P-51 Mustang, Northrop P-61 Black Widow, and the Navy F2A Buffalo, F4F Wildcat, F4U Corsair, and F6F Hellcat fighters. Behind us gather a group of shattered states and bludgeoned races: the Czechs, the Poles, the Danes, the Norwegians, the Belgians, the Dutch — upon all of whom a long night of barbarism will descend, unbroken even by a star of hope, unless we conquer, as conquer we must, as conquer we shall. Even though large tracts of Europe and many old and famous States have fallen or may fall into the grip of the Gestapo and all the odious apparatus of Nazi rule, we shall not flag or fail. We shall go on to the end, we shall fight in France, We shall fight on the seas and oceans, We shall fight with growing confidence and growing strength in the air, we shall defend our Island whatever the cost may be, We shall fight on the beaches, We shall fight on the landing grounds, We shall fight in the fields and in the streets, We shall fight in the hills; We shall never surrender. The materiel and the morale, the qantitative and the qualitative, the measurable and the immeasurable — here’s the great koan around which it would seem much of my thought revolves. If that isn’t a powerful superposition of the immaterial and material worlds in one short phrase, I don’t know what is.